"For whoever has, to him more will be given." For this reason the wise men came to honour the King with gold, frankincense, and myrrh. But that was only at the hour of promise. Promises are not expensive. Yet, how God tested them when they found the Child! There was no throne for Him. And there were no people either. Their star did not rest above a palace. Then in their hearts they thought of another truth, "Whoever does not have, even what he has will be taken away." They would not have said it in these words, yet the question would have burned in their hearts, "Should we take the treasures back again? The King is not what we dreamt . . ." But God overcame them: they truly opened their treasure bags for Him and all was indeed for Him! The wise men understood that it is easy to imagine giving gifts to a Lord of our imagination, but it is difficult to give treasures to a King who makes no effort to be as we considered Him to be. Translated from the Dutch into English. 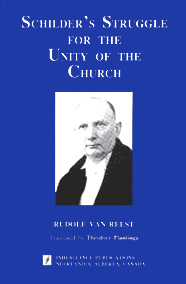 The original Dutch version is also available on CD and included on both the above-mentioned DVD and the DVD with PDF files of De Reformatie. "Therefore, beloved, looking forward to these things, be diligent to be found by Him in peace, without spot and blameless; and consider that the long-suffering of our Lord is salvation  as also our beloved brother Paul, according to the wisdom given to him, has written to you, as also in all his epistles, speaking in them of these things, in which are some things hard to understand, which untaught and unstable people twist to their own destruction, as they do also the rest of the Scriptures."  2 Peter 3:14-16. 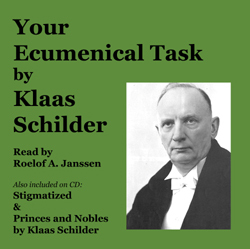 These inspired words of Peter can also, in a lesser sense, be applied to the beautiful meditations of Klaas Schilder, possibly the most important reformer of Church and society of the 20th century. Though his style may indeed be somewhat difficult, one will be hard pressed to find even one meditation that will not, even at the first reading, provide encouragement and direction for our daily life with God. Upon second, third, and fourth readings they will reveal more and more the riches of the Word of God. It is with great gratitude to the Lord that we may introduce this first book of reformational and life-changing meditations. Klaas Schilder, who dedicated his whole life to the service of the Lord  and to the ongoing reformation of His Church, reveals in this book the importance of ongoing regeneration in the life of a Christian as well. 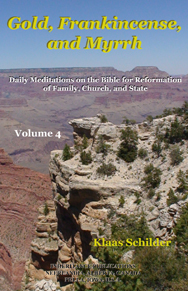 The translation and publication of these meditations is a direct result of apostasy taking place in the Church today. That the Lord Jesus Christ may be in the process of removing the candlestick from Churches that were faithful Churches of Him only decades ago, may be clear to anyone who with a God-fearing mind will reflect upon these meditations. Brothers and sisters in Christ should sincerely and openly discuss matters about the Church today. In Your Ecumenical Task, a speech given in 1951 at a League Day of Young Women Societies, Schilder said, "Whoever readmits or flirts with a heresy that has been condemned by the ecumenical Church at any one time removes himself from the first and oldest ecumenical movement, willed by God." The state of the Church today over against faithful decisions of synods  which are not even overturned but simply neglected, while contrary decisions are accepted, can be clear to all. The Church is in need of ongoing reformation. In De Reformatie of Nov. 12, 1926, Klaas Schilder announced the publication of the first part of Goud, Wierook en Myrrhe (Gold, Frankincense, and Myrrh) in his Bijbelsch Dagboek (literally: Biblical Day Book, or, Daily Meditations on the Bible). "Publication of this work has not yet progressed beyond the first installment of 32 pages plus the preceding introduction etc. The other installments will follow, God willing, regularly." Two more monthly installments were published. 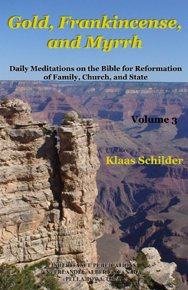 Besides them Schilder completed 12 more meditations (he likely would have preferred calling them Reflections Upon Scripture) for the fourth installment which, however, never was published. He also left several other meditations which were likely to have been included as well. When reading these beautiful and penetrating meditations one may well be wondering, "Why was this work not completed?" Perhaps the answer lies in the fact that these soul-searching meditations needed to be read three or four times before the full meaning dawned on the reader. Certainly, there are enough thoughts to captivate the attention when read the first time, but the reader will likely want to read them shortly after again. 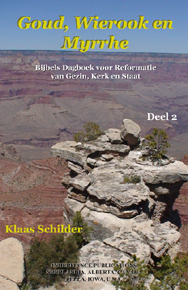 Thousands of readers of De Reformatie very much appreciated Schilders writings about matters concerning Church and world, but some would have found his meditations (regularly printed in De Reformatie) too difficult and perhaps too long. 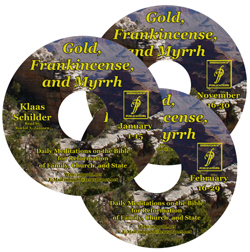 They may not have realized that Schilder, in Gold, Frankincense, and Myrrh, had disciplined himself very much to keep the meditations brief and to the point. And though they may still have been somewhat longer than often found in daily "devotionals", most readers would not have been bothered by the length because of the rich contents. 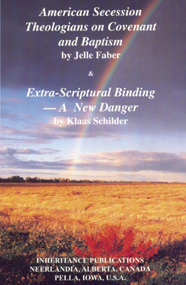 In his introduction Schilder wrote: "It is common among us to question whether a book of daily readings, also when it introduces itself as a book of daily readings on the Bible, would perhaps suppress the reading of the Bible itself. Now he who writes such a book with the intention to help bring the Bible closer into our lives will only rejoice at this question and the desire to maintain the prominent place of the Bible. It also gives him a sense of peace that such people, when they consider this matter so seriously, realize the legitimate place of the Bible in their lives. For he knows that the suppressing of peoples Bible reading is only left to the practice of the readers themselves. For he who loves the Bible with a strong and sincere love will not allow anything to take the place of Holy Scripture. On the other hand, he who allows a book of daily readings to replace the Bible will without doubt not yet have given the Bible its honourable place in his life. For this reason the author of this book is not concerned that it will suppress the Bible for any of its readers. The power of Holy Scripture is too great for that. He will only be delighted if every day, this work gives something so that the Bible is once again impressed upon the readers understanding and conscience. To stimulate this impression he did not add a schedule of regular Bible readings for his readers. The daily opening of Holy Scripture in the homes remains a matter of the families, where particular circumstances may dictate a plan of action. The author has only indicated for each day a particular portion of Scripture as introduction and further explanation of the meditation. Each daily reading is concluded by one or more lines printed in italics, to consider as the leading thought or conclusion of the meditation." 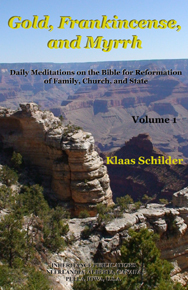 The first 106 meditations from January 1 - April 15 were specifically written (or re-written) by Klaas Schilder for this book. Since this book in Dutch was discontinued, the translator has continued it by translating other meditations of the author. Since the majority of those were longer than the allotted two pages, most of them were divided over several days. To keep the context, one or more paragraphs of the previous day are usually copied or adapted for the following days. In such cases a bold letter in the text of the next meditation indicates the direct link to the previous one. Even apart from this, the reader may occasionally recognize other major parts of an earlier meditation, since the author himself did sometimes borrow from his earlier writings, or rewrote them. 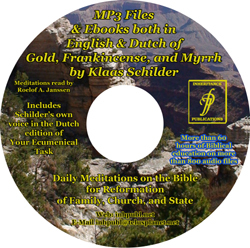 An other important selection of meditations Schilder had planned to publish separately as All or Nothing are included in this book in the months of September through December (though interspersed by a few others). It should be noted that the Scripture passages to be read with the meditations after April 3 were selected by the translator. It is also important to note that Schilder basically used the Dutch Staten Bijbel of 1637. While using it he did not hesitate to correct the translation when needed, though the Staten Bijbel may well be, even today, the most accurate Bible translation in any western language, especially when used with the very important annotations (including alternate translations, explanations, and references) written by the translators themselves. 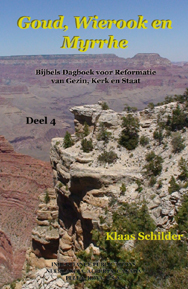 A very accurate translation of the annotations and Dutch text is in the process of being published as The Dort Study Bible. As far as it is possible, it will be wise to use the Dort Study Bible to read the Scripture passages mentioned with each meditation. At this moment only Genesis to Job are available from Inheritance Publications. A good example for following this advise would be Job 19:5-15, to be read with the meditation of Jan. 6. The title of the meditation is "No Repressing." Job 19:5 in the Dort Study Bible includes the phrase "and press my reproach against me" while the NKJV has "and plead my disgrace against me". The keyword connection is lost and so is part of Schilders rich thought process. The Psalms chosen for each day were selected by the translator from the 1984 edition of the Book of Praise (Anglo Genevan Psalter) which can be ordered from Inheritance Publications. As translator and publisher I want to especially thank Mrs. Brian Bevaart for carefully editing each meditation. Editing is always a very particular job, especially when you are not allowed to change what the author wrote. This is particularly true for the works of Klaas Schilder, who in his polemics often revealed errors in the translations of quotes of John Calvin. Thank you Sharon! Will no longer pass in fear. To reveal a blueprint of eternal life. In the Era of Hardening of Hearts? The League of the "Reformed (Calvinists)"
Are YOU willing and able to help translate or edit articles of Klaas Schilder? Do you know of other articles that have been translated?